Butler County Auction - Silver Bars, Coins & Knives Auction - Pick-up in TOWANDA OR SHIPPING IS AVAILABLE!!! SHIPPING IS AVAILABLE FOR THIS AUCTION! Actual shipping charges plus package handling fee. Handling fee discounts available for large purchases. Belt Buckle with 6 Roosevelt Dimes - Neat Piece! 2013 Platinum-Accented Eagle Replicas - Cu, Layered in 24K GOLD with Spot Platinum - 32 g - 40 mm - PROOF!!!!! 2009 Gold Certificates - Cu, Layered in 24K GOLD - 54 g - 50 mm - PROOF!!!!! - THIS COIN IS HUGE!!! 2012 Platinum-Accented Eagle Replicas - Cu, Layered in 24K GOLD with Spot PLATINUM - 32 g - 40 mm - PROOF!!!!! Super Nice! 2012 Platinum-Accented Eagle Replicas - Cu, Layered in 24K GOLD with Spot PLATINUM - 32 g - 40 mm - PROOF!!!!! 2009 Gold Certificates - Cu, Layered in 24K GOLD - 54 g - 50 mm - PROOF!!!!! - THIS COIN IS HUGE!!! BIG!!!!! 2013 Liberty Shinning the Light of Freedom Coin - Cu, Layered in 24K GOLD with Spot SILVER and SWAROVSKI - 110 g - 70 mm - PROOF!!!!! GIANT!!!! 2008 Greatest American Presidents FRANKLIN D. ROOSEVELT Coin - Cu, Layered in 24K GOLD - 14.6 g - 33 mm - PROOF!!!!! 2008 Greatest American Presidents HARRY TRUMAN Coin - Cu, Layered in 24K GOLD - 14.6 g - 33 mm - PROOF!!!!! 2009 Greatest American Presidents RONALD REAGAN Coin - Cu, Layered in 24K GOLD - 54 g - 50 mm - PROOF!!!!! 2008 Greatest American Presidents LYNDON B. JOHNSON Coin - Cu, Layered in 24K GOLD - 14.6 g - 33 mm - PROOF!!!!! 2009 Greatest American Presidents John F. Kennedy Coin - Cu, Layered in 24K GOLD - 54 g - 50 mm - PROOF!!!!! 2014 Presidential Dollar Trials Coin - John Adams - Cu, Layered in 24K GOLD - 54 g - 50 mm - PROOF!!!!! VERY BIG & Heavy COIN!!!! 2014 Presidential Dollar Trials Coin - James Monroe - Cu, Layered in 24K GOLD - 54 g - 50 mm - PROOF!!!!! VERY BIG & Heavy COIN!!!! 2008 Presidential Dollar Trials Coin - Dwight Eisenhower - Cu, Layered in 24K GOLD - 54 g - 50 mm - PROOF!!!!! 2010 Banknotes of the USA - Cu, Layered in 24K GOLD - 54 g - 50 mm - PROOF!!!!! - THIS COIN IS HUGE!!! BIG!!!!! 2009 Federal Reserve Note Coin - Cu, Layered in 24K GOLD - 54 g - 50 mm - PROOF!!!!! - THIS COIN IS HUGE!!! BIG!!!!! 2008 Greatest American Presidents DWIGHT D. EISENHOWER Coin - Cu, Layered in 24K GOLD - 14.6 g - 33 mm - PROOF!!!!! 2008 Greatest American Presidents GEORGE WASHINGTON Coin - Cu, Layered in 24K GOLD - 14.6 g - 33 mm - PROOF!!!!! 2008 Greatest American Presidents THOMAS JEFFERSON Coin - Cu, Layered in 24K GOLD - 14.6 g - 33 mm - PROOF!!!!! 2008 Greatest American Presidents ABRAHAM LINCOLN Coin - Cu, Layered in 24K GOLD - 14.6 g - 33 mm - PROOF!!!!! 2008 Greatest American Presidents THEODORE ROOSEVELT Coin - Cu, Layered in 24K GOLD - 14.6 g - 33 mm - PROOF!!!!! 2013 Greatest American Presidents BARACK OBAMA Coin - Cu, Layered in 24K GOLD - 14.6 g - 33 mm - PROOF!!!!! 2008 Greatest American Presidents THOMAS WOODROW WILSON Coin - Cu, Layered in 24K GOLD - 14.6 g - 33 mm - PROOF!!!!! 2008 Greatest American Presidents RONALD REAGAN Coin - Cu, Layered in 24K GOLD - 14.6 g - 33 mm - PROOF!!!!! 2006 Historical Gold Eagle Replicas Coin - Cu, Layered in 24K GOLD - 32 grams - 40 mm - PROOF!!!!! - THIS COIN IS BIG!!! 2009 Presidential Dollar Trials Coin - DWIGHT EISENHOWER - Cu, Layered in 24K GOLD - 54 g - 50 mm - PROOF!!!!! VERY BIG & Heavy COIN!!!! 2009 Presidential Dollar Trials Coin - DWIGHT EISENHOWER - Cu, Layered in 24K GOLD - 54 g - 50 mm - PROOF!!!!! VERY BIG & Heavy COIN!!! 2003 Historical Gold Eagle Replicas Coin - Cu, Layered in 24K GOLD - 32 grams - 40 mm - PROOF!!!!! - THIS IS Really BIG!!! 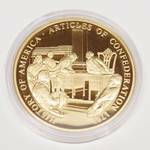 2009 The Birth of our Nation Replicas Coin - Cu, Layered in 24K GOLD - 32 grams - 40 mm - PROOF!!!!! - THIS IS Really BIG!!! 2008 History of America Replicas Coin - Cu, Layered in 24K GOLD - 32 grams - 40 mm - PROOF!!!!! - THIS IS Really BIG!!! Please call BEFORE bidding to see if and item can be shipped!!! Shipping is available only on certain small items on this auction. Items will be shipped via USPS Priority Mail for actual shipping charges PLUS a $5.00 packaging/handling fee. Must be prepaid via credit card (or PayPal) on a PayPal invoice. Items can be shipped!!! Shipping is available on small items on this auction. Items will be shipped via USPS Priority Mail for actual shipping charges PLUS a $5.00 packaging/handling fee. Must be prepaid via credit card (or PayPal) on a PayPal invoice.